October’s cooler weather brings in some hot fishing here in Northern Michigan. Anglers have lots to choose from species-wise. 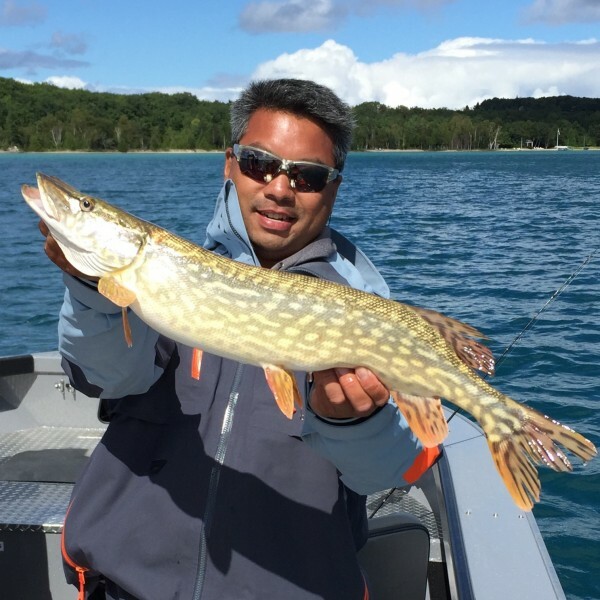 Chasing pan fish like yellow perch on an inland lake or targeting walleyes or river fishing for steelhead or Grand Traverse Bays for big smallmouths—lots of options to keep anglers busy. And happy. Steelhead move into many of the northern Michigan rivers in October, and they feast on salmon eggs. These fall-run steelhead are some of the best fighting steelhead a person could ask for. They often go on multiple runs, jump numerous times and are just plain hard to control. What makes them so much fun is also what leads to lots of break-offs and fish stories. These chrome fish bite patterns like egg imitating flies, streamers, beads, spawn bags, skein, and even spinners and round-bodied crankbaits. They give a little something for both fly fishermen as well as gear fisherman. Steelhead in the rivers this time of year will winter over, spawning in the early spring. Keeping a few for dinner is great, but catch and release of fall fish is really important, as these are the fish that we get to target for the rest of the winter and early spring before the spring-run steelhead move into the rivers. Big lake fishing in October can be stellar. Most anglers that troll for salmon have put their boats away for the year, turning their thoughts to other species or to hunting. Fishing for 2 and 3-year-old king salmon, steelhead, and brown trout can be spectacular when the weather is calm. Some of the best fishing of the year is seemingly a secret to many, but this is also a time when many of the charter boat captains go out fishing for themselves. Inland lake fishing is hot in October when the north winds lay down. Smallmouth bass are voraciously feeding, and much of the fishing these days is relatively shallow. Pan fish are on the feed as well. Big jumbo perch let down their guard and feed heavily on many of the inland lakes as well as the Lake Michigan waters. Wigglers and minnows are the primary baits used to take big jumbos. October’s fishing can be awesome, and with the autumn colors peaking in mid- October, it’s always a pleasure to be out on the water. Get out to enjoy the fall fishery that we have up here, and as always, stay safe and dry!